by Olszewski for the Disneyland Main Street, U.S.A. Collection. This piece also has a special feature that allows the collector to lift off the roof over Walt's apartment. Inside the viewer can find Mr. Disney's apartment in miniature detail. 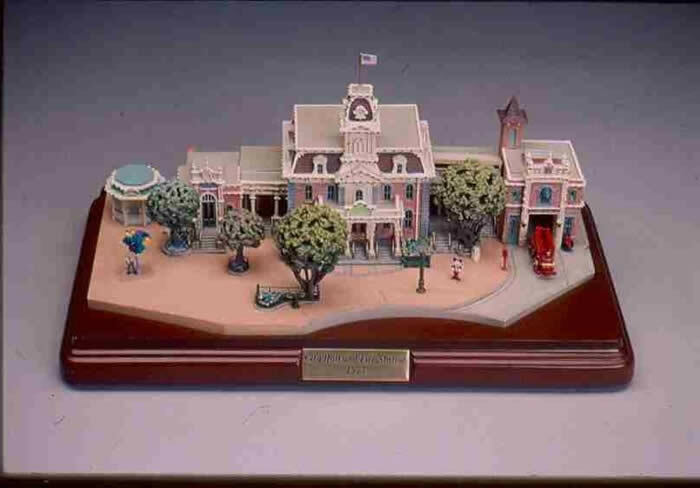 City Hall and Fire Station is configured to illuminate using batteries and the wood base can be removed allowing the piece to be placed in the Disneyland Platform. Click here for platform placement and wood base removal instructions. Sold Exclusively by Disney at the Parks or through Guest Services at 1-877-560-6477.